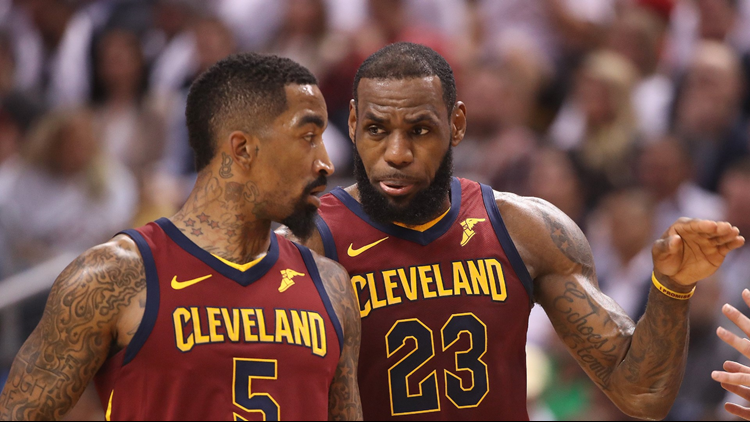 Cleveland Cavaliers forward LeBron James talks to forward J.R. Smith against the Toronto Raptors in game two of the second round of the 2018 NBA Playoffs at Air Canada Centre. After Tuesday night's game, which the Boston Celtics won to take a commanding 2-0 series lead, Smart didn't mince words when asked about Smith. USA TODAY — Marcus Smart took exception to JR Smith's hard foul on Al Horford late in the fourth quarter of Game 2 of the Eastern Conference finals on Tuesday night, running up to the Cleveland Cavaliers guard and confronting him before teammates and officials separated the skirmish. After the game, which the Boston Celtics won to take a commanding 2-0 series lead, Smart didn't mince words when asked about Smith. "That's a dirty shot," Smart said. "You just can't allow that to keep happening. This is not the first time JR's done some dirty stuff, especially playing against us. He's known for it, especially playing against us. We know that. It's like a bully. You keep letting a bully keep picking on you, he's going to keep picking on you until you finally stand up, and that's what I tried to do." Smith was given a flagrant foul one and he and Smart were both issued technicals. "Al, he's a defenseless person (on that play)," Smart said. "He's in the air. He can't control how his body goes. He's not even looking and you go and take two hands to the back?" Horford said that Smith's foul was "uncalled for," but added "that's the one thing about the group of our guys, we have each other's backs."